The Bridal Suite is a spacious and elegant area with private toilet facilities, French doors opening to a wrought iron balcony, and AC. Our bridal suite is perfect for brides, bridesmaids, and family to complete their wedding preparations in total privacy. The Groomsmen Hideout is a private and comfortable room, separate from the pavilion, for groomsmen to change into their wedding clothes, and to get into the spirit of the day. The Hideout is complete with a sink, AC and a minifridge, everything the groom and men of honor need to prepare for the festivities. We provide up to 160 chairs, 20 round tables that seat 8 individuals, five banquet tables and four cocktail tables. Chairs and tables will be set-up to your specifications and broken down at the end of the night by our staff. The Chateau pavilion is complete with surround sound throughout the facility and on the outdoor patios. The system is easy to use by simply plugging in your smart phone, iPad or iPod. The system also includes two wireless microphones for your toasts and announcements. If you wish, load up your smart device and be your own DJ! We also provide a drop-down screen and projector to view slideshows or videos of your timeless memories. The Chateau Events Center was designed and constructed as an outdoor wedding and event venue; therefore, you will find several lovely ceremony sites. Our grounds abound with beautiful, shady trees with night illumination, plus a gazebo and quaint bridge with a waterfall feature. You may choose any caterer you wish or DIY if you are so inclined. Our on-site wedding planner is ready to assist you with these choices depending on your individual needs and budget. You may bring and serve your own alcohol or hire an outside properly licensed distributor. Our elegant bar is situated perfectly for serving indoors and out. We provide a large playground area with balls, toys, tetherball, and soccer goals to keep our young guests entertained and happy. We provide a complete breakdown and cleanup of the facility after your event. We ask that you remove any personal items you may have brought into the pavilion and grounds prior to your midnight departure time. We allow an hour and a half time slot each Thursday for rehearsal. However, if there is no event the day prior, we can change the rehearsal time to the day before your wedding if you choose. As you can see, we are an all-inclusive venue. We don’t have hidden fees or additional expenses and are willing to share with you all we offer to help make your day that much more memorable and stress free. Includes exclusive use of the Chateau and grounds from 9AM to 4PM. Perfect for elopement ceremonies, or couples looking to minimize costs and still get the opportunity to experience the beauty of The Chateau. Two-day package includes the rehearsal dinner at The Chateau the evening before your wedding. Package includes full dinner planning; linens, place settings, menu and beverage selection, but not the cost for these items (their service charges would be extra). Exclusive use of the Pavilion and its grounds from noon to 10PM. We will help with all planning and coordination of linens, place settings, menu, beverage selection, and music (their service charges would be extra). Come enjoy the beautiful river bottom and timeless feel of The Chateau before your wedding day. We offer Day of planning and coordination for all events. Day of planning helps organize vendors and how they fall into the timeline of your wedding day at The Chateau and relieves you of all the stress and pressures that may arise. *Inquire about our active military and small group discounts. 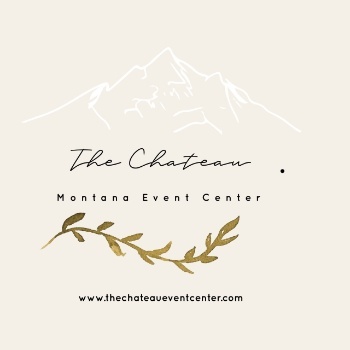 Let us show you The Chateau, a truly unique Montana venue. Feel free to call, text, or e-mail to set up a date and time that works for you.